Carbon-Based Polymer Nanocomposites for Environmental and Energy Applications provides the fundamental physico-chemical characterizations of recently explored carbon-based polymer nanocomposites, such as carbon nanotubes, graphene and its derivatives, nanodiamond, fullerenes and other nano-sized carbon allotropes. 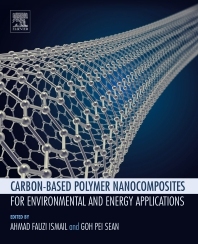 The book also covers the applications of carbon-based polymer nanocomposite in the environmental and energy fields. Topics range from the various approaches that have been explored and developed for the fabrication of carbon-based polymer nanocomposite, to their applications in tackling environmental and energy related issues. Ahmad Fauzi Ismail is the Founding Director of Advanced Membrane Technology Research Center (AMTEC), Universiti Teknologi Malaysia (UTM). He earned a Bachelor of Engineering in Petroleum Engineering (1989) and a Master in Chemical Engineering (1992) at the UTM, Malaysia. He earned a Ph.D in 1997 from University of Strathclyde, UK. He has more than 25 years of experience in the development of membrane technology for various applications. He has published more than 450 scientific papers, 6 books, 3 edited books and more than 40 book chapters. He has won many outstanding awards such as the Merdeka Award 2014, IChemE Malaysia Inventor of the Year Awards 2014 and the Malaysian Toray Science and Technology Award 2014. He is a Fellow of The Academy of Sciences Malaysia, Chartered Engineer in the UK (CEng) and a Fellow of the Institution of Chemical Engineers (FIChemE). Pei Sean Goh is Senior Lecturer at the Faculty of Petroleum and Renewable Energy Engineering at the Universiti Teknologi Malaysia (UTM). Her research interests lie in the fields of fabrication of nanostructured materials for membrane-based separation processes. One of the main focuses of her research is the applications of carbon-based nanomaterials and nanocomposite membranes for acidic gas removal as well as desalination and wastewater treatment.